Loving God is so beautiful. It is my duty and I have to decide to do it, consciously. One of the most helpful things that Jesus did for us was the clarity of His teachings. He was so clear about some issues that we tend to get confused about them. Agreed, some of Jesus’ teachings, like His parables can be quite difficult to understand sometimes but most of his words were just so clear cut. I guess our confusion has to do with our tendency to want to complicate things. God is so simple we find it hard to understand him. I can almost imagine the crowds circled round Jesus, with some of them shuffling their feet awkwardly, some nodding and others just giving him a blank look as they almost asked, “That’s it?” They probably stared at Jesus for a long time as they mentally pictured scrolls upon scrolls filled with the laws Yahweh handed to Moses, comparing all those rules with the simplicity of Jesus’ words and wondering how he could say that was all. Love. But that is the SIMPLE truth. This is all it takes. This is all he asks of us; that we love, that we be faithful in giving our all. And considering all he has done for us, this is not too much to ask. Really. We have not been called to do anything but love. We have been called to be faithful. We have been called to walk with God and to be portals who give as we have received. 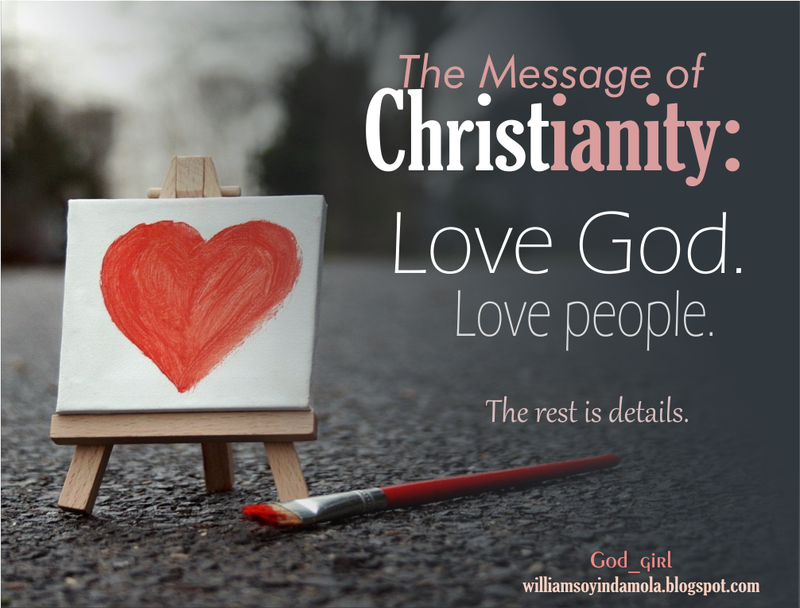 What then does it mean to love God? First, it is a choice, as it always is with God. As much as he desires that we love him, God would not force it on us. Doing so is hardly love. How would you feel if someone came to visit you simply because they had been compelled to do so? You would rather they had stayed back! God created us as with freewill because he wants to delight and find pleasure in us. He desires to see us choose him. Over our fears, over our ambitions, over our desires and our desperate need for acceptance. He wants to be above all that. He wants us to choose Him. And I guess this is all it boils down to. Choosing to love with all our understanding, heart and strength. Who do we choose? In that moment when we are torn between loyalty to God and the seductions of the enemy, who wins the bet on our lives? Do we weigh God on a scale with those enticements and shrug, deciding that after all, those things weigh more than he does? I have been thinking about this. When I open my mouth to say God is worthy, do I really mean it? Am I not weighing him with those other things and deciding that maybe, just maybe God isn’t worth as much as them? You see, it goes beyond singing a couple of beautiful songs. I mean, I like songs. Really I do. But can we just cut out the hypocrisy a little bit? Can we allow our hearts speak before our vocal chords enter a frenzy of melodies? Can we just stop for a second to understand the meaning of the words we let spew out our lips? Is it too much to ask that we find substance to back up our words? Because words on their own are very cheap; anyone can afford them. So, loving God is beyond what we profess. It is beyond the fancy stickers, hashtags, lyrics and pretty words. “Loving God means doing what he tells us to do, and really, that isn’t hard at all;” (1John 5:3 – TLB). That’s it. It’s just so really simple. But do I get this? Do you? So, secondly, loving God is doing what he tells us. It is doing his bidding without hesitation or regret. It is seeking to please the Father who gave his all for us. It is trusting his instructions knowing that the one who gave his very life for us has a beautiful plan in everything. It is devotion that is more than routine. It is giving our all. It is loving people. It is worship. And this is what I am learning to do. Picking up my cross. Choosing this cross with joy and a sense of privilege at the beauty that I finally get to love the one who sought me out when I didn’t even care anything for him. It may seem hard (even though it really is not, “for every child of God can obey him, defeating sin and evil pleasure by trusting Christ to help him.” - 1John 5:4). It will cause me to bleed and maybe even die. But I will choose life. Even if it means my life. It would be nice if you could pray about this. **This post is based on the "What I have been learning" series.